For this blog, I wanted to do something a little different. The way that agriculture "works" in different countries around the world is very different from what we, as North Americans, are used to. When I first found out that you could grow more than one crop in a field at the same time I was baffled. I had grown up driving up and down the 401/402/403 corridor where you see nothing but endless fields of corn (or wheat or soybean or whatever it is that the farmer is growing in the rotation that year). Or, if the farm had been subdivided into smaller plots, each plot would still be its own crop. I've even driven repeatedly by a sod farm and was amazed that people actually farm grass (but I guess sod does have to come from somewhere, doesn't it?!). In warmer climates in Central and South America, as well as almost all of Asia, some of Australia and almost all of Africa, agriculture is very different. Instead of relying on one crop for a field, a whole bunch of crops are all planted at the same time in a small area. 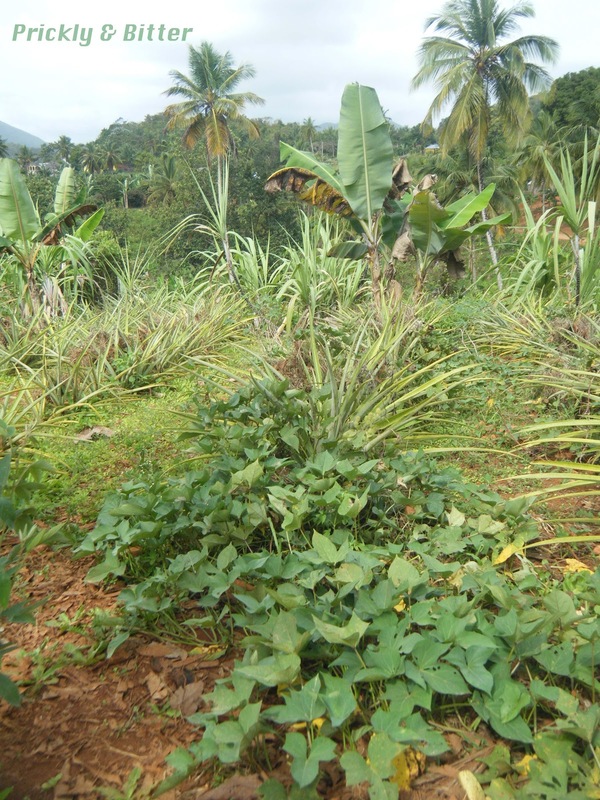 The idea is that if one crop fails, you still have other sources of food to rely on. Very few of these crops would interfere with each other, and some might even act synergistically to increase yield. A very exciting prospect, especially as we are struggling to produce enough food for the world's ever growing population. So how does this work? It's not just a haphazard mess of plants in a dense thicket and you get what you get. There is still a significant amount of order in a tropical food plantation, and there's a lot of planning that needs to go into making sure that taller plants that will grow into trees or large shrubs won't be planted near plants that cannot tolerate shade. Plants with vast root systems should be planted near the bottoms of trees that are already established so they can't compete for resources (the tree would almost always win that battle!). This type of agriculture is sometimes referred to as "vegeculture" (monoculture planting in cooler climates is called "seed planting" agriculture), and since I was lucky enough to be able to visit a small farm in Dominican Republic I figured it was worth exploring a bit. These first two are photos of what a typical farm plantation might look like. You can see that there's still a semblance of rows that are planted, but the rows also each have more than one plant species. There is no effort put into weeding or spraying against weed volunteers (a "volunteer" is either a plant seed from the previous year's crop that pops up during the current growing season, or an adventitious weed that grows much faster than the crop you're trying to grow). Weeds are typically short-lived plants, and if you plant creeping vines as has been done in the upper photo then this is less of a problem (or is very quickly eliminated as a problem). So what do we have here? How many crops can you actually see in the photo? Well, when I was on the farm I counted at least 8 different crops in a very small space but now (of course...I didn't write them all down) I can only see six. So let's look at each one of these using the top photo, zooming in on some that can be distinguished easily (at the very least, picked out with the help of coloured boxes...). Red box: This plant is very, very hard to see but it's certainly worth a short discussion. Between rows, cassava (Manhiot esculenta) is planted. Cassava, sometimes called yuca (NOT yucca!) or tapioca, is planted. The crop harvested from this plant are the very deep-growing storage roots that are used in a manner similar to a potato. The downside of cassavas is that they contain cyanogenic alkaloids (aka cyanide) and must be prepared very carefully. Once prepared properly, they can be sliced and fried or mashed and are often consumed in a stew-like preparation as a side dish for chicken. Blue box: These are pineapples (Ananas comosus)! Immature pineapple plants just look like spiky plants you don't want to come across in a dark alley, eventually growing into the plant that can be easily recognized as a pineapple plant from my last blog post (which you can read HERE). Yellow box: This is a low, creeping vine that is often propped up (either on stakes or in a more natural form as a corn stalk or sunflower stalk) off the ground. These are sweet potatoes (which might be called yams but are NOT true yams; Ipomoea batatas), grown for their sweet, potato-like fleshy root. Sweet potatoes, unfortunately, aren't always sweet. There are definitely the sweet sweet potatoes that we are used to in North America and that Europeans are used to, but there is also another variety (some call it species) that is much less sweet-tasting. There are also very lightly coloured sweet potatoes (not the bright orange-yellow sweet potatoes we're used to) which may or may not be correlated with sweetness (up for debate). Pink box: This very tall, grass-like crop is sugarcane. There are actually two different types of sugarcane present, one called black sugarcane (the one that's outlined in the box with the black-purple stem) and regular sugarcane (the tall grass in the purple box; both the species Saccharum officinarum). 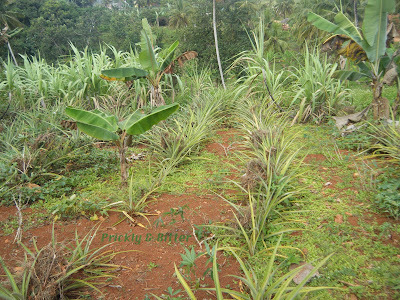 Black sugarcane, while loaded with sugar, is not used to extract sugar from. Instead, in the Dominican Republic, it is used to cook some of their traditional foods and is eaten whole when young. The regular sugar cane is what is grown for sugar extraction. Purple box: Bananas, relatively short-lived as far as "trees" go, are often planted as a staple crop in tropical countries. Sometimes these banana trees are true bananas (Musa acuminata x balbisiana; read all about bananas HERE), while the rest will be plantains (the same species, but a different hybrid cross). They are much starchier than dessert bananas, and are much more versatile in cooking. The dessert bananas, part of the ABB subgroup, mean that they have two times the number of Musa balbisiana chromosomes in their genome than plantains, which are in the AAB subgroup (twice the Musa acuminata genes). It seems as if the back-cross, what gives that second either B or A genotype, is what determines the sweetness versus the starchiness of a banana. Brown box: This is a coconut palm tree (Cocos nucifera which you can read all about HERE). Interestingly, there are more coconut trees in the Dominican Republic than there are people and all of them are owned by the government. If you want to buy coconuts they are delivered by the thousand (yes, that's right. The smallest number of coconuts you can buy at a time if you are a Dominican citizen is 1,000 coconuts) in a truck, and you're set for quite a while. Coconuts are one of the most versatile foods in tropical countries because they're not just used for food! If you carefully cut out the flesh you can use the leftover hull as a drinking vessel, the juice on the inside (the coconut water) can be used instead of saline solution in hospitals or cooked with, the flesh can be turned into coco butter or coconut oil for cooking (or eaten cooked or raw), and the hulls can be burned for fuel. The hulls also contain very strong fibres that can be woven into mats or cordage. You can see why they're so popular! The wood of the tree can also be used as either firewood or as a building material, depending on the age of the tree (the older the tree the less structurally sound it is, and the less likely it can be used, or would be used, to build a house). This is just a small sampling of the number of species this one farm was growing; they also had breadfruit, mango, papaya, cotton, peppers, sage, basil, coriander/cilantro, thyme, allspice, coffee, cacao, tamarind, and annatto (to name a few...)! A pretty productive farm, and nowhere near the size of a multi-crop fruit and vegetable farm in Canada or the United States! Unfortunately, more and more "traditional" cropping systems are popping up in Central and South America, due mostly to the influence of North American principles on traditional practices of South Americans. Sugarcane, banana and tobacco plantations are becoming more and more prominent, and are leading to serious problems with crop losses because of multi-chemical resistant pathogens that are attacking the fields. This is also leading to increased spraying, and since there aren't as strict regulations in these areas with chemicals that can and cannot be used on edible food this is being passed down to consumers in countries that import these crops. Many of these chemicals are highly carcinogenic, meaning they can cause cancer in very small quantities. Others are highly allergenic, and may explain at least part of the reason why some children are developing multiple food allergies. For example, there is a very high prevalence now of children being diagnosed as being allergic (or "intolerant") to gluten. Strangely enough, these same kids have no problem if they're eating homemade bread. It's just the bread in the bag from the mass-producer that causes them problems. Obviously this isn't a case of gluten intolerance; gluten is in all wheats, regardless of where it is acquired or how it is processed or who bakes the bread. The difference is in the number of chemicals on the wheat itself: if you bake your own bread you have the choice of where you obtain your wheat flour and if it's "organic" (however the farm or governing body defines that word) or not. A very interesting theory, and time will tell if there's any weight behind the idea!